This website has launched at November 2013 especially for celebrities news and gossips with Fashion and life style entertainment news also. 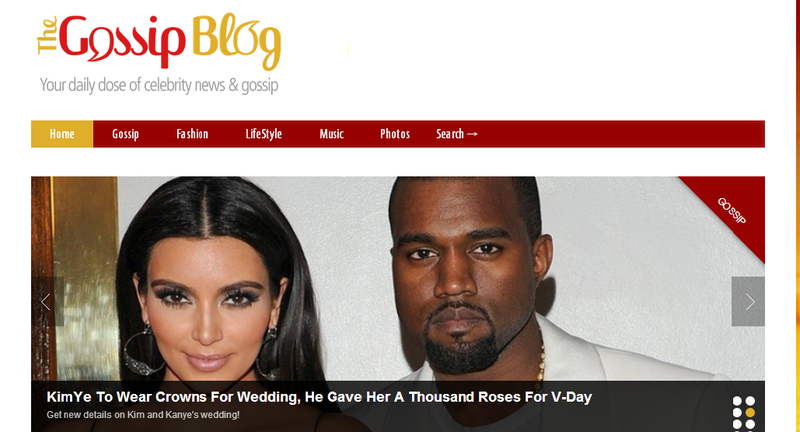 You can find the latest Music trend and fashion trend easily with this thegossipblog.com website. They also have 1000s of celebrity pictures with juicy stories to entertain us. The latest Celebrity Gossip is Megan Fox and Brian Austin Green welcomed their second baby boy. This two gorgeous celebrities are very happy that they welcomed their second baby. Kim Kardashian going to launch a baby line cloths in march and she has designed a lot of cloths for kids and her statement is "Kids growing fast and they need affordable cloths". Honey that's sounds awesome and we all are waiting waiting for it :). Are you in curious to know how celebrities celebrated their Valentine's day? Here are some gossips on this news from thegossipblog.com. OMG can you believe this? Jason Derulo gifts 10,000 Roses to Jordin Sparks. Wow!!! that's amazing valentine's day gift indeed for a lover. He surprised her lover with 10,000 lovely red roses, what else she needs more than this love. I am really inspired by this gift. Shakira Announces ‘Awesome Song’ With Blake Shelton! OMG our favourite singer Shakira announces "Awesome Song" with Blake Shelton, isn't sounds great and interesting? Meantime, Shakira and Rihanna’s song “Can’t Remember To Forget You“, has reached 100 million views on Vevo. Wow!!! Congrats!